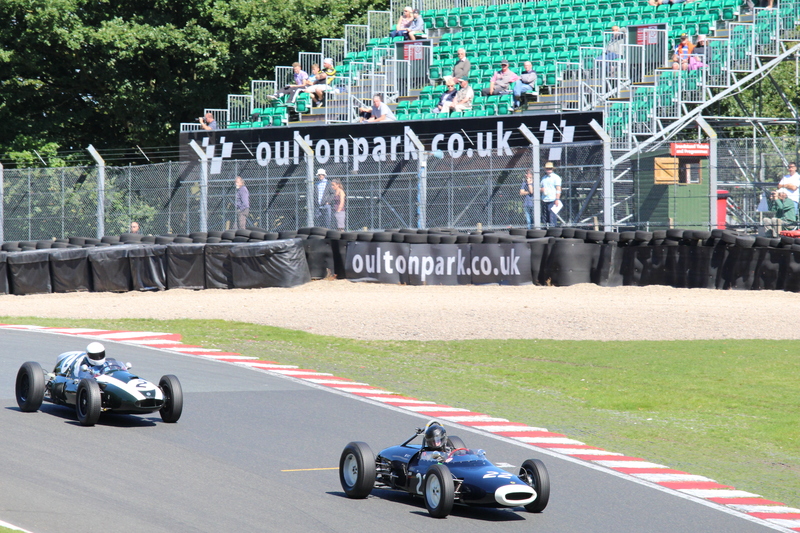 One of the most picturesque circuits in the UK, Oulton Park lies in the heart of Cheshire. It’s formerly the home of Oulton Hall, an 18th Century manor house it’s known that the then formal garden was handed over for parkland. The estate was used as a base during the Normandy Landings, but its true beckoning occurred since with the transformation to the Oulton Park Circuit. The circuit is carved out of these rolling hills and lush flora & fauna, and whether you’re a driver or spectator provides some great racing. The Gold Cup was one of the UK’s most sought after events. From 1954 the likes of Stirling Moss, Roy Salvadori, Jack Brabham, John Surtess, Derek Bell, etc claimed victories in the category of the day. The golden years ended toward the end of the 1970s with some hard fought Formula 5000 Gold Cups then John Surtees took his 4th victory in 1981 in a rain-soaked historic Gold Cup driving a Maserati 250F. Current formula cars returned shortly thereafter and the Gold Cup was run ne arly every year until it was last awarded in 2001. Pictured right: Brad Hoyt and this Lola T330 were no match for the front runners in the Derek Bell Trophy for Formula 5000 cars. 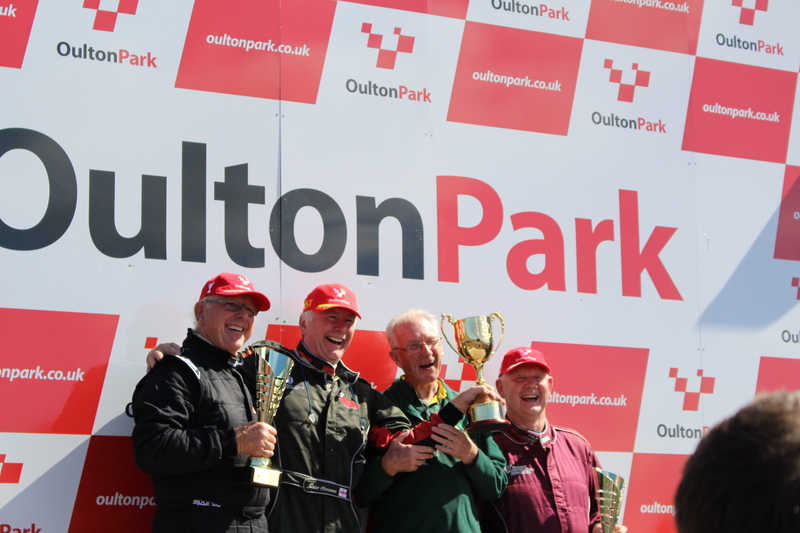 That’s until 2016 where this Oulton Park Gold Cup would once again see the Cup awarded to a race victor. The HSCC (event organiser) chose that the Cup be awarded to the winner of the HGPCA’s Pre-1966 Grand Prix car race. 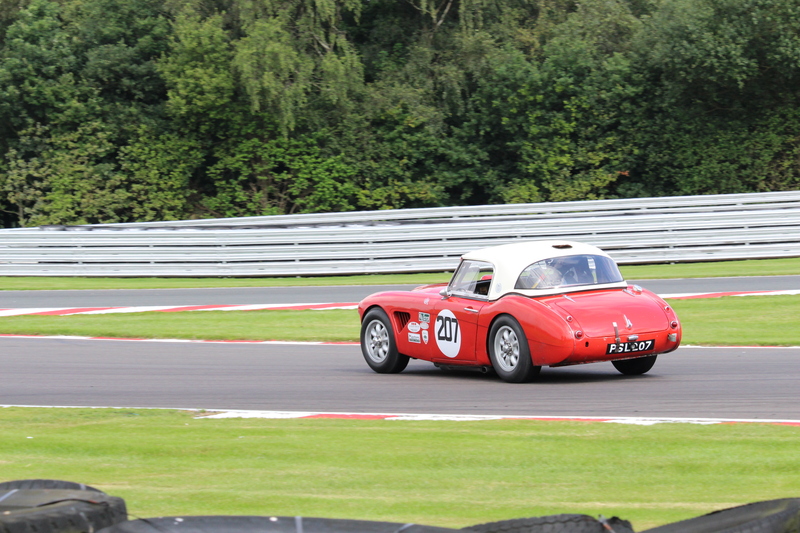 Now in its 50th year, the HSCC certainly knows how to organise a race meeting. It’s held across three days of the Bank Holiday weekend, but not every category races all three days. Some come and go early, while there are races for others later. For the Formula Junior races, they put up grids for both Front-engined & Rear-engined cars, with each having a practice and two races. Australians competing – of course, it wouldn’t be a major historic race meeting without at least one on track, or perhaps five as was to be the case at Oulton Park. A few weeks prior to the meeting Bill Hemming had crashed his recently acquired one-off Tojero FJ at the Copenhagen GP event. At the eleventh hour the re-build (including bodywork) was completed at the base near Bristol. So Bill was on the road bound for Cheshire. Disaster struck early in the trip when a fuel pump failed in the tow vehicle (this van also housing the car and sleeping quarters). Attempts to get a new part, then find a rental van to get the little Tojero to the track both failed, so a suitably grumpy Bill arrived late that evening in a Peugeot hire car. He was not too happy, but some food and a drink soon fixed that, and he had the antics of fellow Victorian, Kim Shearn to keep him occupied. Kim competing in his Lotus 18 FJ. It was Kim’s second time competing at Oulton Park, but the first was a few years ago that he had to start again and learn the track. “It’s a difficult track to learn” he said. “Particularly following the high-speed Old Hall Corner you travel downhill toward a blind crest (one of several at the circuit) … you know there’s a corner after this, and instinct makes you apply the brakes, all to learn that once you reach the crest the corner is yet another 200 metres away” he went on to say. This corner is a downhill sweeping lefthander; some say the best in the UK. The remaining three Aussies came from three other states, Tasmania, South Australia and New South Wales. Scotty Taylor in his Cooper T45 in the Pre-1966 Grand Prix car race, with Tim Kutchel (SA) and Wayne Wilson (NSW), both in Brabhams were mixed in with other open wheel cars of that era, including Formula Ford 2000 cars. The Jaguar Classic Challenge class is very popular. Whilst not consisting of entirely history history-based cars, it’s for those set up to a criteria developed by the HSCC. Dominated by E-Tyes, whilst there were also MkII & XK150s. Their sole race saw a hard fought battle early on between Alistair Dyson and Callum Lockie, but it was Lockie who stormed home for a convincing win. 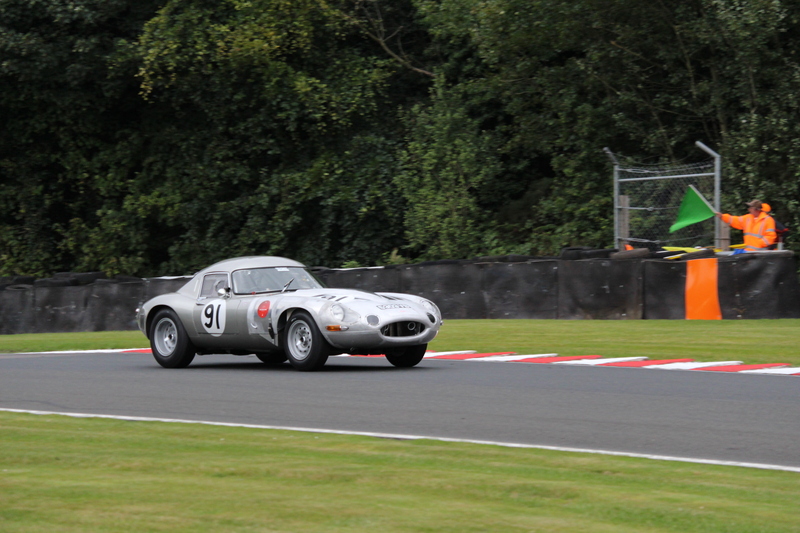 Above: The Jaguar E-Type owned by Julian Thomas, was driven by Callum Lockie, seen here on the green flag lap for qualifying on Saturday. As mentioned earlier, the FJHRA arranged two grids for front & rear engine cars. This was as part of the Formula Junior Diamond Jubilee World Tour. In the front engine races it was a battle up front for Elva vs Bond marques. Mark Woodhouse would conquer outright taking both races in his Elva 100. While Mike Walker (driving Jon Goddard-Watts’ Bond) would finish second ahead of this stunning Bond of Andrew Tart in third. In the later rear-engine car races it was Andrew Hibberd who set the pace during qualifying, then maintained his qualifying lap speed in both races to take out the two race wins in his Lotus 22.Brian Simms finished second in race two in his Merlyn Mk5/7 ahead of the Brabham BT6 of John Fyda. Kim Shearn failed to finish race one when a water pipe fell off (literally, and not seen since!). fortunately, after some searching a replacement part was found, and even more fortunate was that more serious damage to the engine did not occur. Shearn started from rear of grid in Monday’s final 11 lap race and drove through to finish in twelfth overall. The HGPCA puts on a good show, from the ‘red truck’ (hospitality set up fit for a king) to the action on the track. And with Rod Jolley competing in his Cooper T51/53 we saw plenty of three-wheeled over-steering action from the fabricator extraordinaire. The presenter said “…no doubt saving on tyre wear”, and then in accepting the Gold Cup after taking out Monday’s race Peter Horseman (driving a Lotus18/21) said “If Rod used four wheels can you imagine how quick he’d be”. The Cup was presented by period Lotus mechanic, Bob Dance. Bob started at Lotus in 1960, and now continues to this day as a mechanic at Classic Team Lotus. 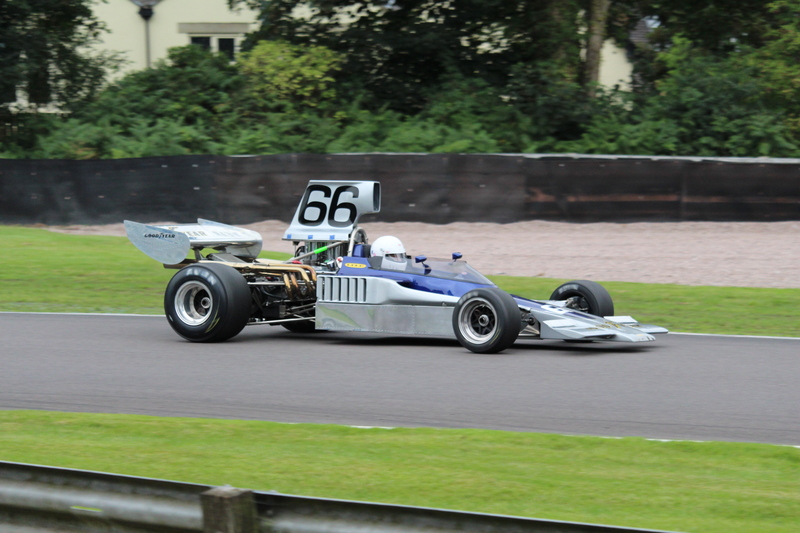 Dan Collins finished third in his 1.5lt Lotus 21. Above: Rod Jolley (#2 Cooper) in hot pursuit of race winner, Peter Horseman. Above: Peter Horseman (second from left) accepts the Gold Cup from Team Lotus mechanic, Bob Dance. Rod Jolley is on the left with Dan Collins far right. It’s hard to believe that Super-Touring cars are now seen as historic, but nevertheless they’re out there and put on a good show at the meeting. They’re changing hands for good money these days too, although a fraction of their build cost in the day. It’s the high-tech running costs with all the telemetry, etc that makes them a more expensive car to run in historic racing. The Audi photographed here was one of a couple on track at the event, driven by Keith Butcher. Above: Impressive set up for the Super Tourer cars. It’s still a ‘clubbie’ style meeting though, big crowds, but not overcrowded. Entry is reasonably prices and you can walk around most parts of the circuit for various vantage points, and indeed throughout the paddock area. Australian, Scotty Taylor – Cooper T45. This is the ex. Jim Russell car (of UK driver school fame).